Nope, I didn’t consult the random number generator for this one. 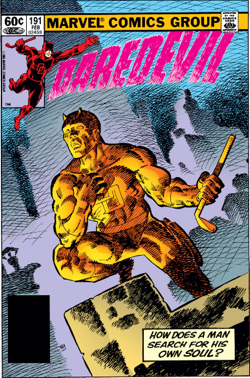 Daredevil #191 was reprinted in Daredevil #500, and while including old content might be considered padding (well, it is), this Frank Miller classic was a very good choice. In fact, Daredevil #191 may well be my favorite single issue of Daredevil, or at least in the top three. For starters, the art makes me take notice in a way most issues do not. Unusual angles, perspectives and panel layouts combined with the generous use of negative space makes Roulette an interesting-looking issue. It provides sufficient detail while guiding the reader along. The story itself is told mostly in the form of a monologue, as Matt Murdock pays a visit to a the hospital bed of the now paralyzed Bullseye. Unable to move, or even speak, Bullseye has no choice but to listen to what Daredevil has to say, his first order of business being to introduce Bullseye to a game of Russian Roulette. After the first round, Daredevil launches into a story that touches on both his lives, the one behind the mask, and the one as Matt Murdock, the lawyer. The story he feels such a compelling need to tell revolves around the child Chuckie, the son of a client of Matt Murdock’s who’s developed a fascination with Daredevil. It turns out that Chuckie has been spending hours every day watching his video tape of Daredevil’s televised fight with Bullseye, and he gives Matt quite a shock by insisting that he, in fact, is Daredevil. Driven by his need to find out more about his effect on the young boy, Matt pays a visit to Chuckie’s school, in costume, and gives him the experience of a lifetime. He indulges Chuckie’s fantasies, and in doing so makes his first mistake. His second mistake is following a lead given to him by Chuckie regarding his father’s whereabouts when he should have been looking after the boy, which leads inevitably to mistake number three. Catching Hank Jurgens, Chuckie’s father, being blackmailed to hide evidence supporting the embezzlement accusations against him, Daredevil knocks him unconscious while Chuckie watches on. The way Matt tells Chuckie’s story is calm and rational, almost subdued, but there is no denying the impact of these events on him; or the reader for that matter. 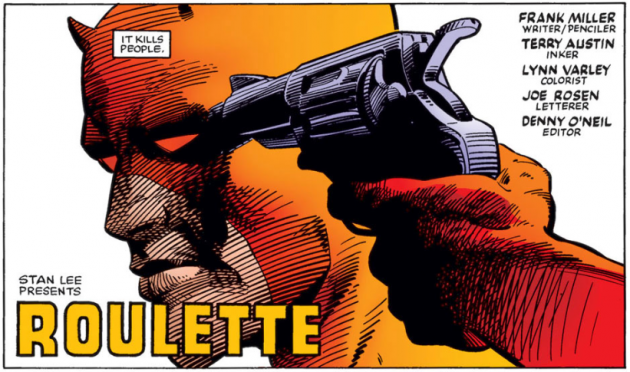 Roulette is a very powerful story in its simplicity, framed by the rounds of Russian roulette that sees empty round after empty round go by until everyone, including Bullseye, knows that the bullet is meant for him. However, not all is at it seems. In the final pages, Matt continues his story with the same kind of candor that characterized his portrayal of Chuckie and talks about his father, his life and the things that matter to him. He talks about his hatred of Bullseye and his desire to see him gone. Still, because Matt is who he is, there is only one way for the story to end; with a gun that has no bullets. The tension and drama of this issue are extraordinary and keeps you hooked until the very end. For me, this is an issue I have returned to many times, and it has never failed to touch me, or make me notice something new. It’s very Daredevil, very Frank Miller, and just a damn good story. An awesome story. It never fails to move me every time I go back to read it. Very good post. I loved it! I liked the tension it creates to keep you glued to keep reading. Well done! I think we forget, or at least I forget, that this was a transition period from being the Scarlet Swashbuckler to the brooding man without fear we know today. This was the issue that, to my mind, completely turned that corner. That’s why Miller is great. That’s why Miller is terrible (in that I miss that Scarlet Swashbuckler). And it’s certainly why we’re about this story 25 + years later. Great post. I think one of the great parts about this issue is that, on a first reading, you actually find yourself believing that Matt is going to kill either himself or Bullseye. How often can you say that in a mainstream comic book? This was early enough in Bullseye’s reincarnation that he could actually be killed off and it certainly seemed that Frank Miller was intent on making Matt a much darker, more tortured hero. That suspense really drove this issue for me – will he or won’t he? The final page always forced something of a sigh of relief from me, a muted “Wow, that was close!” As the cover suggests, it really is a fight for Matt’s soul – a fight he wins. I definitely rate this within my top ten single issue, which I will post about soon, I hope. It’s just a wickedly written piece of comic. Possibly even faultless. And it’s DD, so it all aligns for me. Thanks for the write up, always nice to be reminded of the classics as often as possible. Great review of a classic Miller story. This was one of my favorites that was collected in vol 3 of the Miller Visionaries trade. Going to go back and reread my copy now! Christine, you nailed it! As a person of faith/attorney/comic lover, that book just blew my mind. You are assuming that Daredevil is talking. It could just as easily be that he is silent and the text is his internal monologue. That’s the way I’ve always read it. I suspect Miller wrote it ambiguously, so that it could be either way.